For demonstration I will try to solve the problem of document management system where I need to store different types of documents, letter and invoice document. Here is the class diagram. 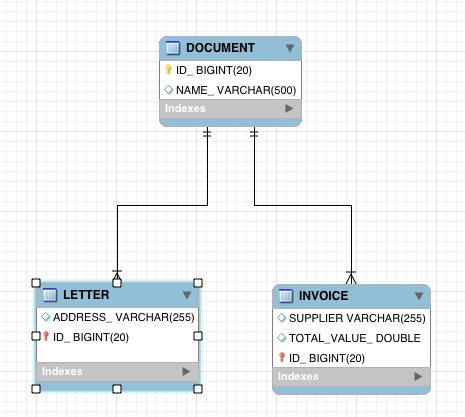 For single table strategy JPA will create one table that has columns from all entities from the inheritance tree. Observe the DOCUMENT_TYPE column, this is the discriminator column used by JPA to distinguish document types. @MappedSuperClass marks non entity super class. 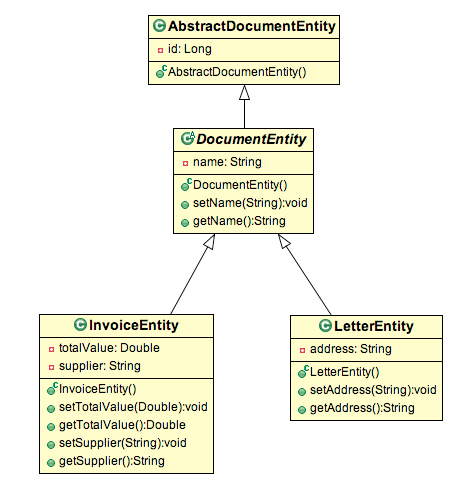 Invoice Document entity extends the Document Entity and important part is the annotation DiscriminatorValue. I will get to get in a bit. I will use spring repository to have CRUD support and write a unit test that will demonstrate insert and select all functionalities. After this test is executed next SQL queries are used. Observe the INV and LET values, this are the values from the discriminator value specified above. This is the simple select all query. To demonstrate joined strategy few changes must be done in the entities annotations. Unchanged parts are not shown in the listings. I hope that this tutorial will help you to decide what inheritance strategy should you choose.